Like Oesterbro, this quarter is normally divided into inner and outer Noerrebro. During the last couple of years inner Noerrebro has become the trendiest quarter in Copenhagen; here youll find the fancy, hip and stylish cafes and shops, and it gives a good picture of the Danish lifestyle. It is situated just beside the lakes and is an expensive place to rent apartments. 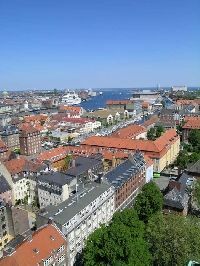 Many buildings date back to the 19th century, when the centre of Copenhagen became too small for its residents. Moving around, youll come across Turkish fast-food outlets, trendy cafes, second-hand shops, discotheques and small greengrocers. You can be sure to find whatever you are looking for and more..Life here is intense and very lively during the day Noerrebro is the most populous quarter in Copenhagen and the large number of bars, cafes and clubs also make it the most popular nightlife area in the city. The traffic can sometimes be stressful, but good public transport services make it easy to move around and to reach other parts of Copenhagen.